Age Intervention Retinol PLUS provides unparalleled skin rejuvenation benefits. The most aggressive levels of stabilized all-trans-retinol are synergistically combined with advanced topical agents to maximize efficacy while simultaneously decreasing or even eliminating acclimation/irritation concerns. Helps to boost collagen levels. Water/Aqua/Eau, Caprylic/Capric Triglyceride, Cyclopentasiloxane, Glycerin, Glyceryl Stearate, Polysorbate 20, Carthamus Tinctorius (Safflower) Seed Oil, Butyrospermum Parkii (Shea) Butter, Myristoyl Tripeptide-4, Polysorbate 60, Stearic Acid, Stearyl Alcohol, Cyclohexasiloxane, Retinol, Sorbitol, Bisabolol, Sodium Hyaluronate, Camellia Oleifera Leaf Extract, Palmitoyl Tetrapeptide-7, Palmitoyl Oligopeptide, Chrysin, Dimethicone, Dimethicone/Vinyl Dimethicone Crosspolymer, Glyceryl Acrylate/Acrylic Acid Copolymer, Steareth-20, N-Hydroxysuccinimide, Triethanolamine, Carbomer, Hexylene Glycol, Ethylhexylglycerin, Caprylyl Glycol, BHT, Phenoxyethanol. Great retinol...but give it at least 3 months before you really start to see results! Great product for you morning routine! Finally I have found a retinol product that is lightweight and effective for my morning routine. My dark spots have faded and my skin is smoother. I also like that I can wear this product under my makeup! Jan Marini products are still expensive. However, I do purchse when I can use a discount. Her products do work for me.I still stand firm that am not a big supporter of the packaging change from the dropper bottle. My only complaint about this product is the packaging. The cheap plastic lid cracks and breaks leaving the pump top exposed. I travel a lot and I can't take any Jan Marini products with me because they all have these plastic lids. When the lid breaks and pump top is exposed, the product leaks out in my travel bag. Great products, bad packaging. I understand the beneficial properties of retinol, but I always wondered if any non-prescription products would be worth their weight in "green". I think this one is! 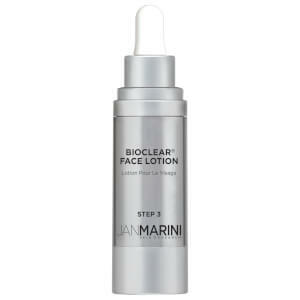 I LOVE all of my usual Jan Marini products (on occasion try something else, but ALWAYS go back!). This one is lightweight, absorbs pretty well, and has definitely worked to minimize some fine lines. Its a tiny bit greasy on the forehead, but otherwise no complaint. I will purchase again.